Each top sheet will be printed throughout the Block-mate blocks with logo with the same design. Similar items to Shaped Block-mate blocks with logo, click here. 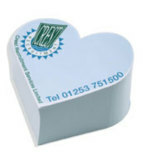 For more information prices and samples on Shaped Block-mate blocks with logo. click here and fill in the contact form and we'll get straight back to you.